The reality-show star took to Instagram again on Sunday night to promote morning sickness medication Diclegis, this time with extensive risk information. Celebrity Kim Kardashian West posted what she called a #CorrectiveAd on Sunday night, adding extensive risk information to a deleted post she made on behalf of morning sickness pill Diclegis earlier this month. The Food and Drug Administration said an earlier post, featuring the same image as Sunday’s, was "false and misleading" because it failed to include any information about the drug’s potential risks. The federal agency sent a warning letter to drug maker Duchesnay USA, which markets Diclegis, on August 7. Sunday’s post, which went online during MTV’s Video Music Awards, contained a lengthy disclaimer about potential side effects. "I guess you saw the attention my last #morningsickness post received. 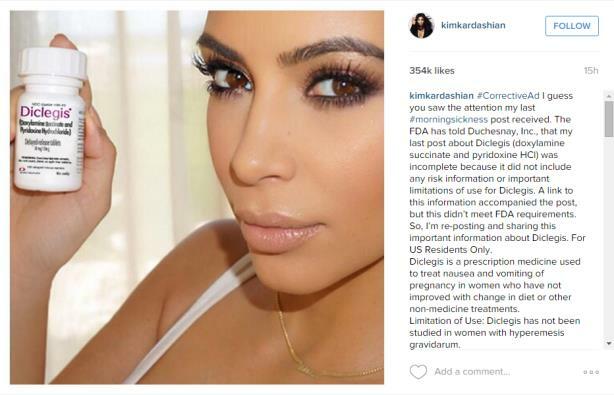 The FDA has told Duchesnay Inc. that my last post about Diclegis was incomplete because it did not include any risk information or important limitations of use for Diclegis," Kardashian said in the more recent Instagram post. "A link to this information accompanied the post, but this didn’t meet FDA requirements. So, I’m reposting and sharing this important information about Diclegis."